The internet may have spoiled it over the course of this morning, but yes, Battlefield is going back to the early 1900’s with Battlefield 1. Battlefield developer DICE is currently hosting a lengthy “History of Battlefield” live broadcast on Twitch.tv. The event began this morning, with developers reminiscing on the series and its evolution over the past 14 years. After its early days in World War II, the competitive shooter series found itself thrust into the future with Battlefield 2142, and back into the near future with Bad Company and Battlefield 3 and Battlefield 4. With the help of Visceral Games, the Battlefield franchise explored the realm of crime drama with the cops-and-robbers Battlefield: Hardline. Despite NeoGAF posts of GameStop posters and accidental listings on Xbox Live and PSN, moments ago EA’s Executive Vice President Patrick Soderlund officially revealed Battlefield 5. Titled “Battlefield 1”, the latest chapter of the series takes place in an alternate version of World War I, with moderately advanced weaponry. According to presenters Lars Gustavsson (Design Director), Aleks Grondal (Senior Producer), and “Westie” (DICE Game Changer QA program and YouTube fame), Battlefield 1 will take players through several familiar locations of World War I, along with some of the lesser-know hot-zones such as the deserts of Arabia. Though Battlefield leans towards squad-based combat, multiplayer will also be balanced for those who choose to fight solo. Grondal also states that Battlefield 1 will include a unique roster of vehicles, some of which are the largest in the franchise; as seen in the new trailer, players have access to biplanes, triplanes, battleships, bombers, tanks and horses. Shovels, maces, rapiers and bayonets scrape the surface of the new close-quarters combat melee weapons to be found in both the single and multiplayer modes; according to Gustavsson, Battlefield 1 will be more “up close and personal” than previous entries. For the first time in the series’s online multiplayer history, friends will have the option of using a new “Persistant Squad” feature online; Battlefield 1 players can create a permanent 5-player squad that can transfer between servers. Weapon customization will return with some enhancements, however details are reserved for a future date- potentially E3 2016 or EA Play. Battlefield 1 will release on 10/21 for Xbox One, PS4 and PC; a playable Beta will go live early for Xbox One and PC players through EA Early Access, Origin Insider and Battlefield Insider members. 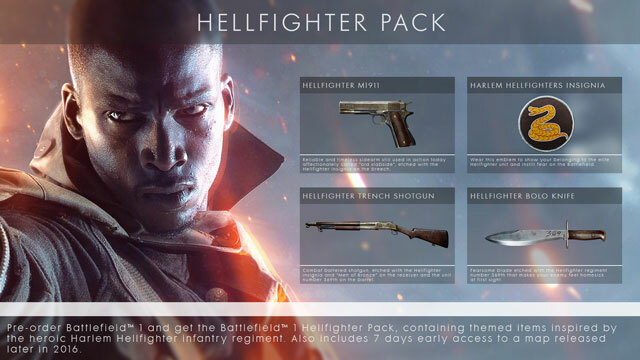 Though not officially covered in the Twitch.tv reveal, a GameStop listing on NeoGAF shows that pre-orders will include a DLC bonus based on the decorated Harlem Hellfighters of WWI.